I don’t know what it is but we are obsessed with Food Trucks. 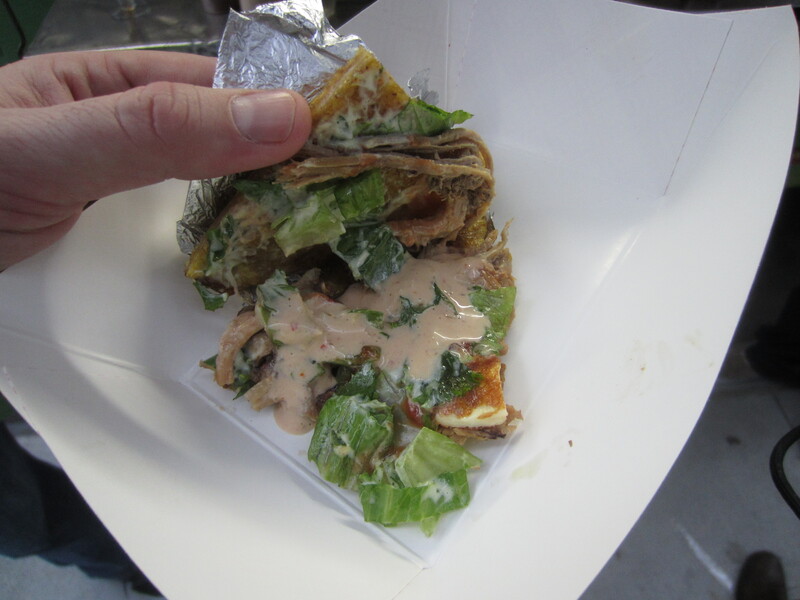 There is some magic in ordering gourmet food items at an affordable price from a mobile kitchen and eating while standing up. 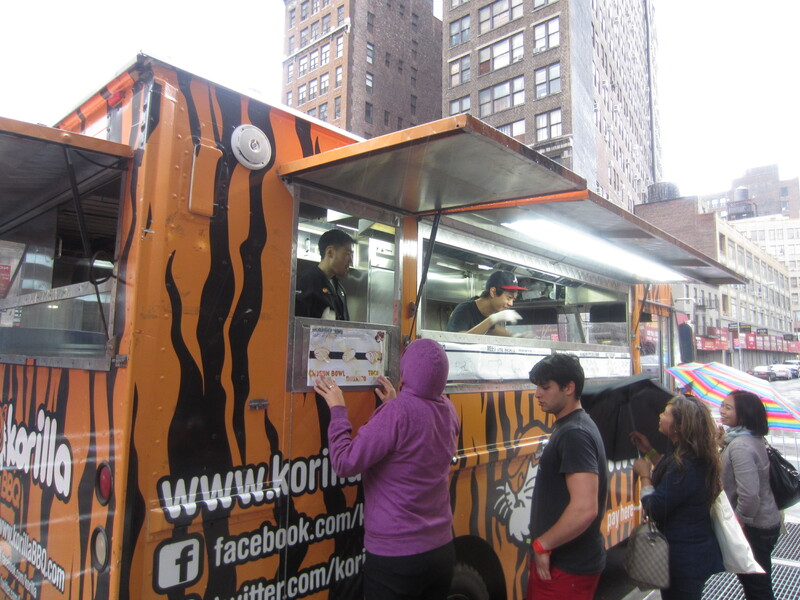 Aside of the novelty factor, many of these trucks are being manned by really talented Chefs making really innovative dishes and who doesn’t want to eat awesome food? With very little storage space, Food Truck curators have to focus on a smaller menu often times focused on one item or cuisine. 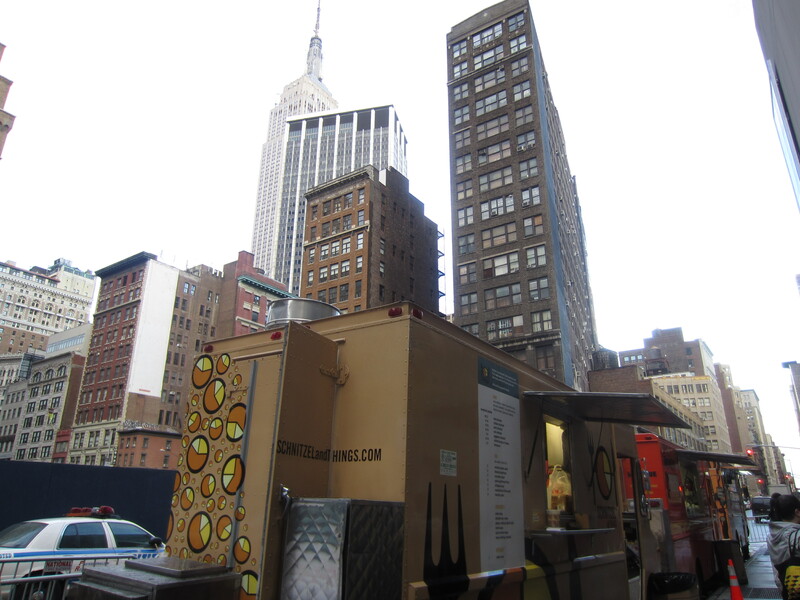 For the really creative truck Chefs, this allows them to offer specials, one offs and seasonal items because changing the menu is really easy. It’s a fantastic piece of our available food choices out there and I love it when people recognize that these mobile restaurants can be as unique, gourmet and awesome as your most formal fine dining establishment. 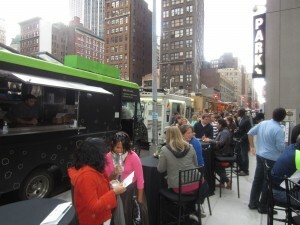 Enter, Carts in the Parc, a special event that happened for the 2nd time at the Food Network NY Wine & Food Festival. Some of New York City’s most sought after and popular Food Trucks pull up outside of the new age, fast casual restaurant Foodparc, and server their special dishes to the hungry in attendance. 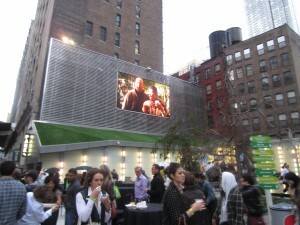 It’s hosted by Andrew Zimmern, host of the Travel Channel show Bizarre Foods. It all comes together around Blue Moon beer to make a fun afternoon of food and drink. 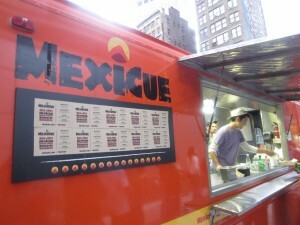 There’s a reason for all the buzz in NYC about the Mexicue truck, its’ freakin’ delicious! These guys know what’s what with their food menu of Mexcian meets BBQ items. 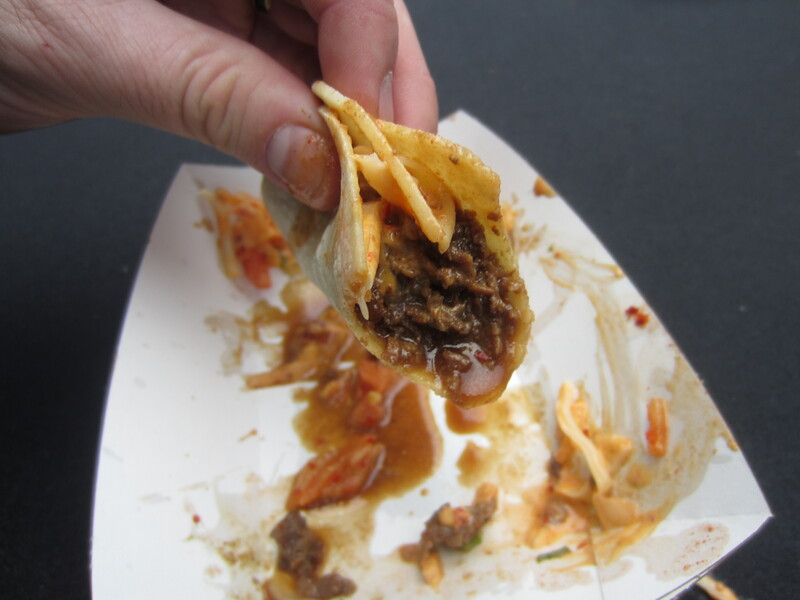 The Burnt Ends Chili is smoky, bold and very savory. 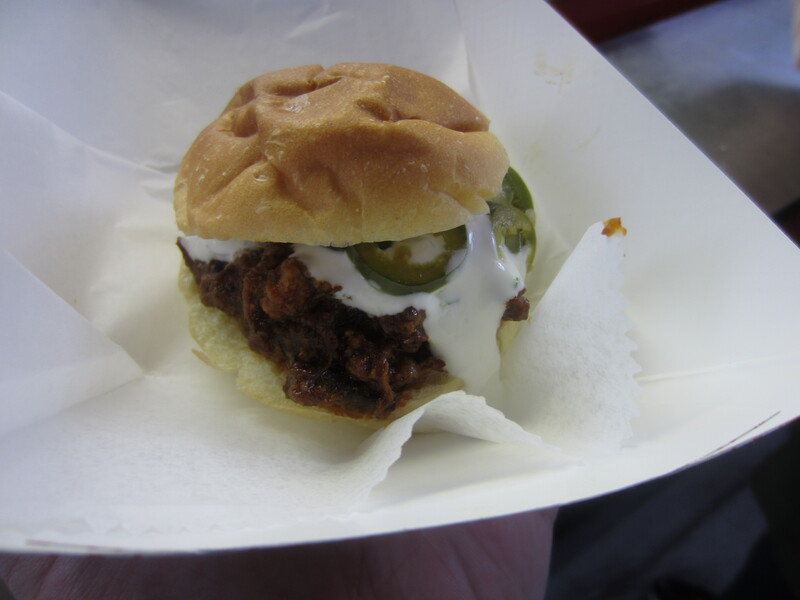 On it’s own, it great but throw in the cooling tastes of the Lime Crema and the sweet-hot of the fresh Jalapenos and you got yourself one awesome little sammie. Assuming you were once a kid and you grew up in the USA, a Grilled Cheese sandwich is a special treat that reminds you of a comforting childhood meal. 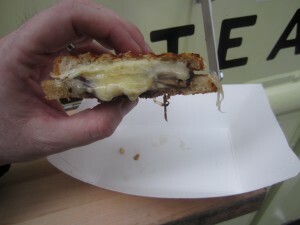 It’s a simple concept that warms the heart and the stomach; melted Cheese between two pieces of toast. 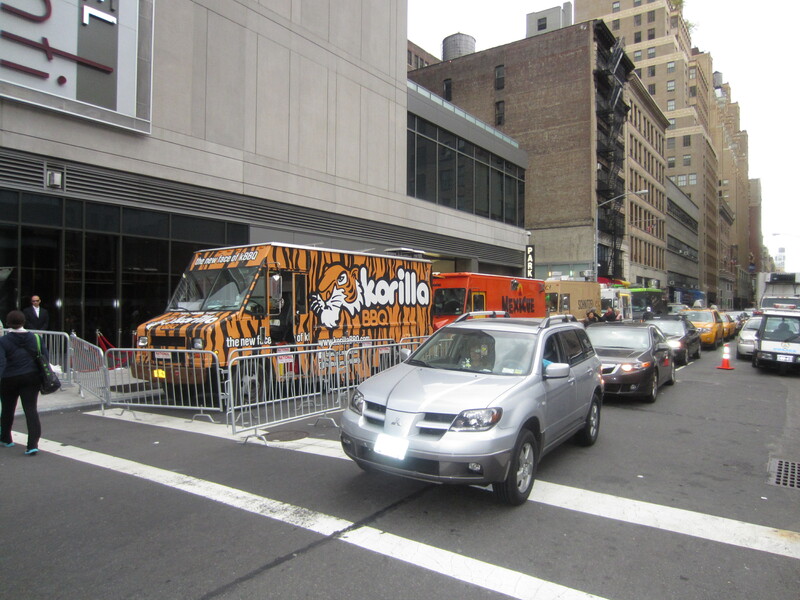 The allure of the sandwich is an easy attention getter for any new business. 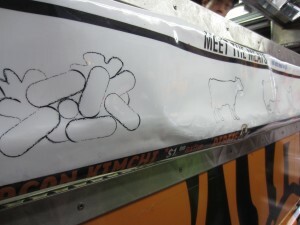 Recently opening here in NYC, the Milk Truck instantly drew up attention for just such a reason. I was psyched to finally paw my way into one of them. After removing the Mushrooms (I don’t eat anything I can grow between my toes), I chomped into the grilled Cheese. Yummy, creamy, crunchy, hot and very good. Pork Patacon (Green Plantain Sandwich) – with Shredded Pork, Ketchup, Queso Frito, Lechuga, Tomate, Salsa Especial(Ketchup, Fried White Cheese, Lettuce, Tomatoes, and Special Sauce. As part of the offerings at this event, not only could you eat from the trucks but also food items from the Foodparc itself. As this is a “Burger” blog and I hate to go to off topic, I had to eat one. 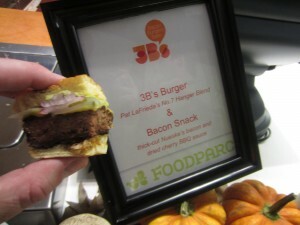 I’m not going to review it though because a cold bite of one Burger that had been sitting out in an attempt to feed a lot of people really fast, would not be representative of how good the 3Bs Burger is. For that, read this post. 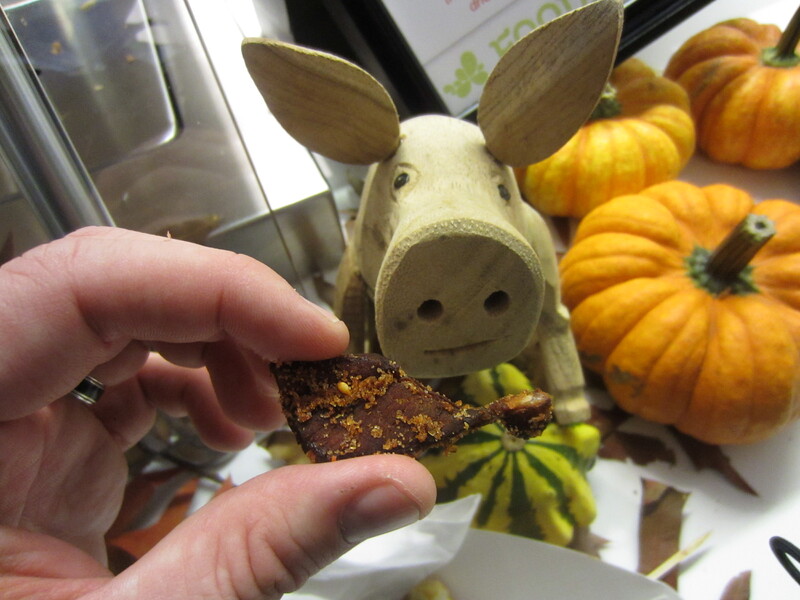 However, the Bacon Snack…well that was freakin’ awesome. 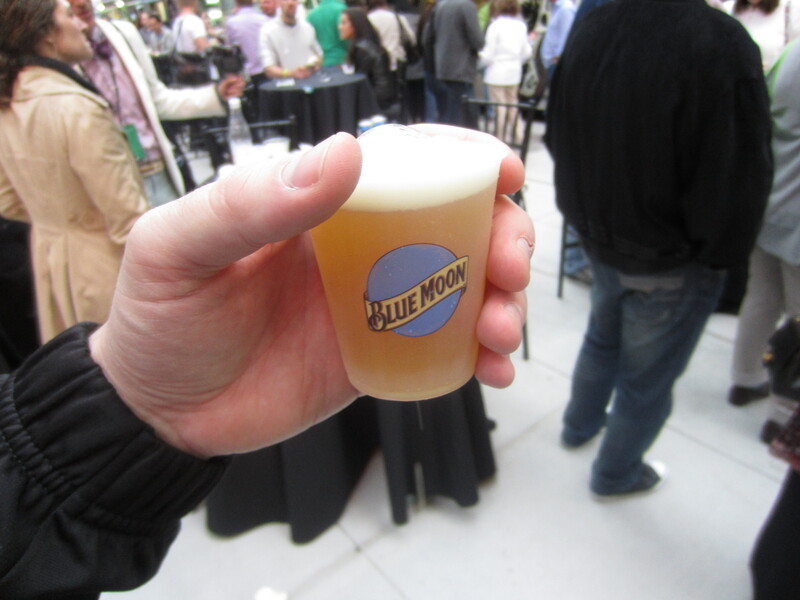 A little sweet and a lot of savor, this almost had a jerky like quality. Definitely worth a try. Ribeye of the Tiger – Thinly sliced Marinated Ribeye with Red Kimchi, Pico De Gallo, Monty Jack Cheese & Korilla Sauce. I’m a HUGE fan of the Food Network’s “Great Food Truck Race” so I’ve been dying to try these guys since watching them on season 2. 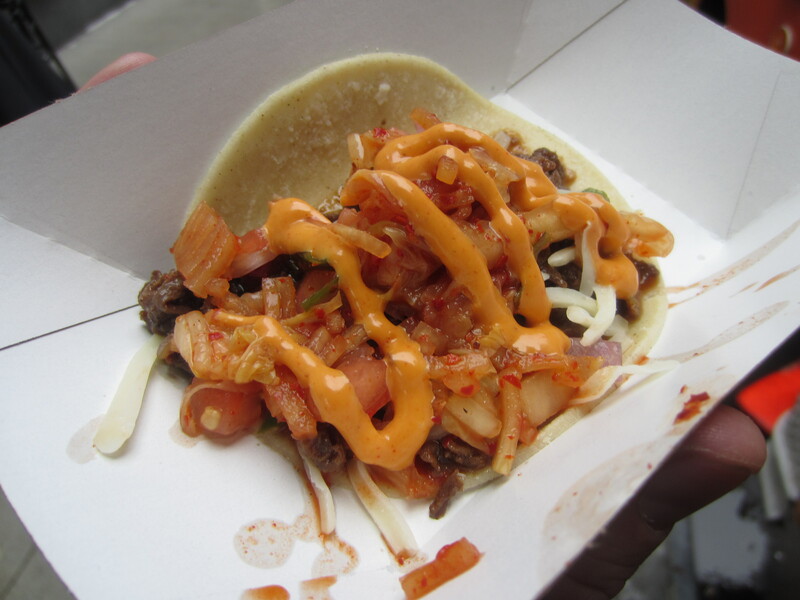 They have a great concept mixing Mexican style Tacos with traditional Korean fare which normally, I have only experienced after throwing back several Beers. I’m a little skeptical about Kimchi and really only like it in small doses and when mixed into other things, like Bibimbap. Putting all that aside, these were WAY BETTER than I expected. The Korilla Sauce, which is a smoky Chipotle Mayo really adds and awesome layer of flavor that works to weave all the different ingredients together. The Kimchi is spicy but somehow they’ve figure out how to get it not overplay as a flavor, letting the Ribeye really win the battle. Pork Pita – Charcoal Grilled Pork, Wrapped inside a warm Pita with Tomato, Red Onion, hand cut Fries and dressed with Tyro-Kafteria Sauce. 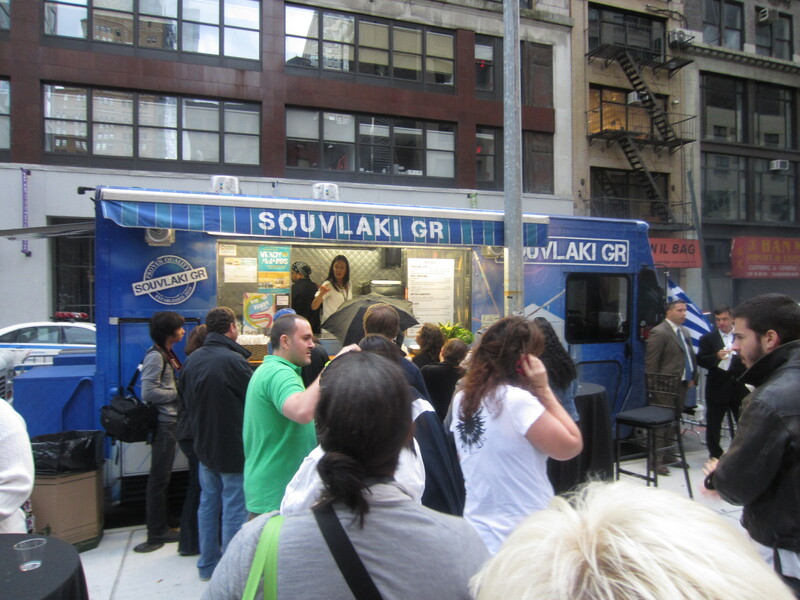 We waited in line for this truck twice. Why? It started to rain and we ditched to go back inside of Foodparc. 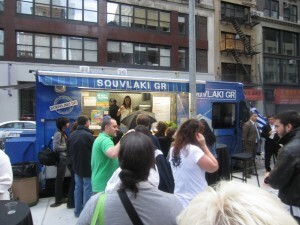 Once the clouds and rain cleared, we popped right back over, excited to try Souvlaki GR. 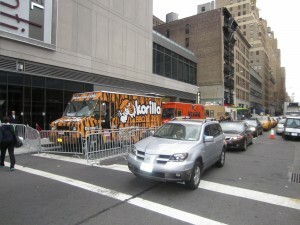 We were just in time as they were handing out the last 5 sandwiches they had on the truck. DING! DING! DING! WE HAVE A WINNER! 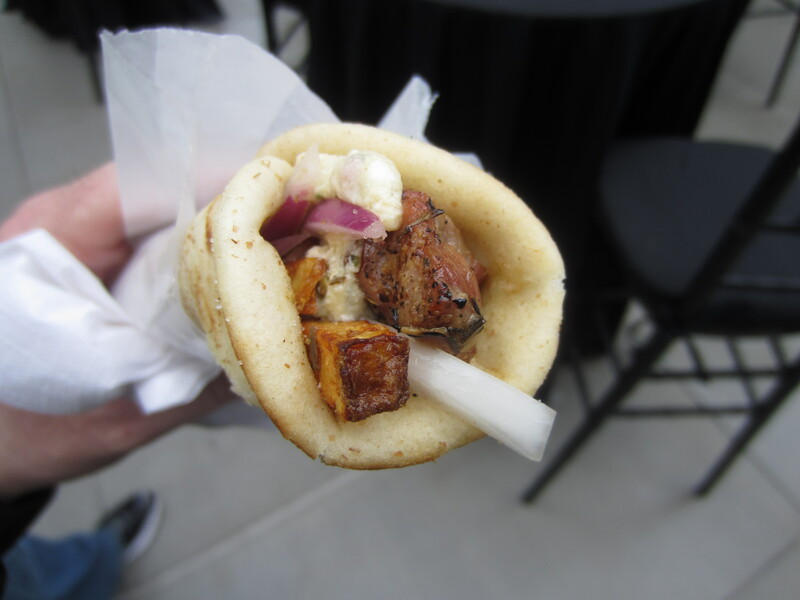 The Pork Pita was my favorite item of the day. What was it? Warm Pita, Tangy Sauce, well prepared Pork? No, although all of those were good and important, it was the hand cut Fries stuffed into the pocket Sandwich that cut this offering made my fave. A simple idea done super well. 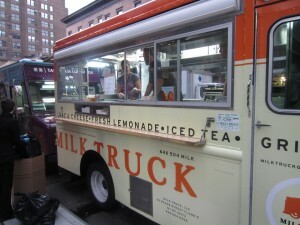 I would definitely hunt down this truck to get another!! 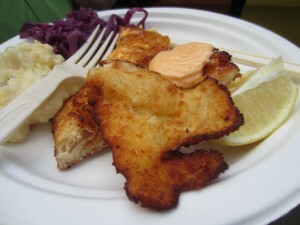 Chicken Shnitzel – with Warm Potato Salad, Garlic, Dill Braised Sauerkraut with Spicy Sriracha Mayo. Mike is not really a fan of Pork and as I ooohed and ahhhed my way through the Pork Pita, he decided he needed one more bite. 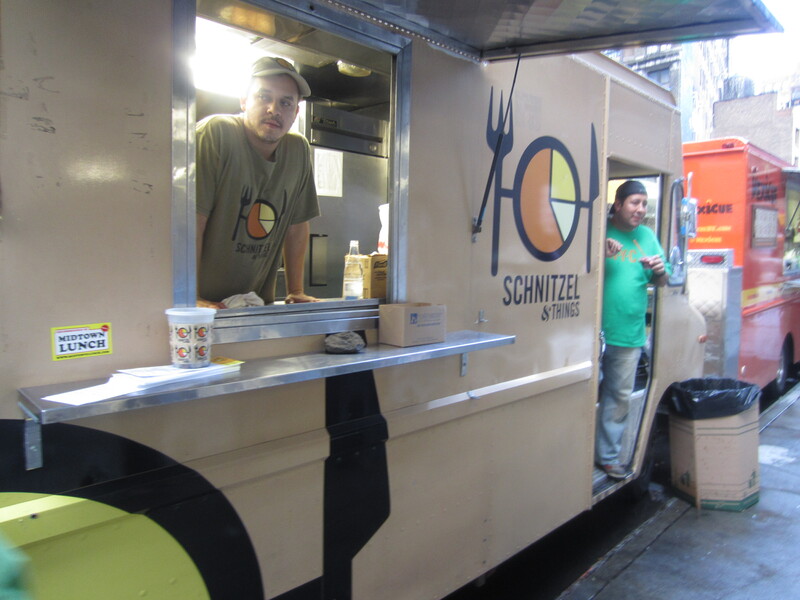 With nobody in line at Schnitzel and Things (the event was almost over and most people had already left,) it became and instant target. Can’t say I would leave my house craving this traditional German dish but if I was, I’d definitely consider getting it from here. The lightly breaded but crunch Chicken is good and the sauce they put on it makes all the difference. This is one worth checking out. Thanks to Mikey for the ticket hook up. Had a blast eating everything that I walked past! 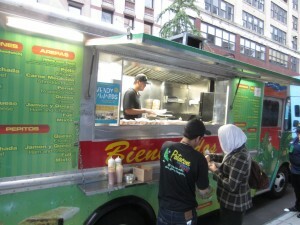 This entry was posted in Beer, Burgers, Event, Gourmet Burgers, Hamburgers, New York and tagged 3bs burger, Andrew Zimmern, bienvenidos, burger, carts in the parc, cheese, ciancio, conquest, food truck, foodparc, french, fries, great, hamburger, korilla bbq, milk truck, new york, new york food and wine festival, ny, nyc, rev, review, schnitzel and things, souvlaki gr, the, the great burger conquest hamburger cheese french fries review Dreams Riviera Cancun Resort playa del carmen mexico room service karl jule wedding, the rev meter for social community, trucks. Bookmark the permalink.